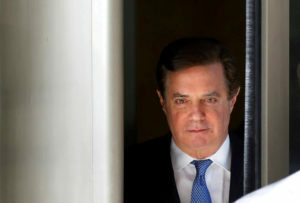 Special counsel Robert Mueller is considering new charges for Donald Trump’s former campaign chairman after his plea deal fell apart over allegations of lying to investigators. That’s what prosecutors told a federal judge Friday in the case of Paul Manafort. The judge ordered the government to disclose more details about the false-statements allegations against Manafort by next Friday and set a tentative sentencing date for early March. Manafort is accused of repeatedly lying to investigators even after he agreed to cooperate with the investigation into Russian election interference and possible coordination with Trump associates. Manafort faces up to five years in prison on each charge in his plea agreement. He also is set to be sentenced on eight felony counts in a separate case in Virginia in February. He has denied the lying allegations.